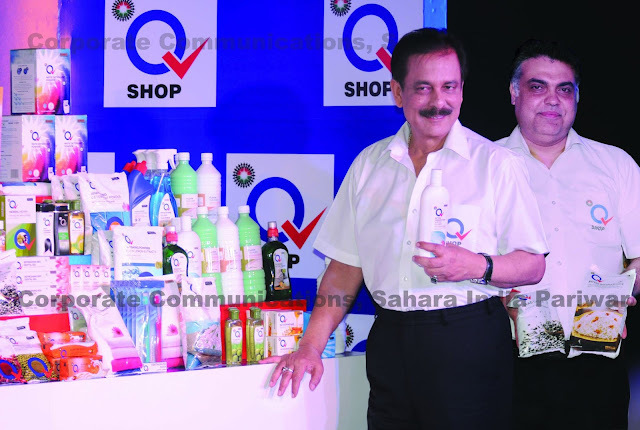 On the occasion of the launch of Sahara Q Shop, ‘Saharasri’ Subrata Roy Sahara, Managing Worker & Chairman, Sahara India Pariwar, said, “I always believe that as a citizen of a great nation, we deserve the best quality living, be it where we live, how we live or what we consume. Sahara India Pariwar is, for the first time, offering through Q Shop completely adulteration-free 100% Quality Consumer Merchandise products to the country. You can receive from us all types of 100% quality household items every month in the comfort of your home. This means unadulterated, pure and defect-free items will be delivered from the source to your home. With this mission, to curb the menace of prevalent adulteration practices in the market, Sahara Q Shop is committed to the guarantee of good health for you and your family. Sahara Q Shop will revolutionize the concept of easy and hassle free shopping. household items will be available at fair market price (sometimes even for less). In addition, you will receive 100% quality items right at your doorstep. There probably cannot be more honesty in business. Our Quality Consumer Merchandise Retail is entering the market to destroy the devil of adulteration and also making the revolutionary idea of easy and hassle-free shopping a reality. An All-India Quality team of 800 people, comprising of 50 Scientist Associates, 250 Senior Quality Assurance Advisors and 500 Associate Quality Assurance Executives, is working diligently to provide you unadulterated 100% quality items. Our officers are appointed at factories, fields, etc, i.e., at all the sources for intensive quality control and vigilance. Let’s move ahead, let’s take a big leap of the Best Quality in life together with Q-shop.